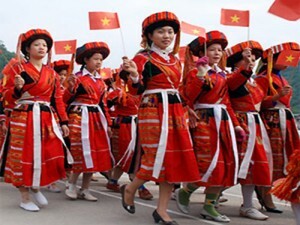 The 8th Cultural, Sports and Touris m Festival of Northeastern ethnic groups will take place in the northern border province of Tuyen Quang from September 27th to 30th alongside with the province’s Culture and Sports Week. The event will be co-hosted by the Culture, Sports and Tourism Ministry and 8 regional provinces and cities includes various interesting activities, such as artistic exchange among ethnic groups in the northeastern region, Then singing, performances of different traditional instruments by ethnic people, photo exhibitions, beauty contest and sports competitions. The Festival, “Northeastern – the sacred and beautiful region”, will be inaugurated at 20:00 hours on September 27th at Tan Quang Park.